A network analyzer is an indispensable tool for any test engineering professional. It is a powerful piece of test equipment that can monitor electrical networks and analyze the humongous chunks of data that flow through wireless applications every second. These instruments are especially suited to measure the linear characteristics of radio frequency (RF) devices but some sophisticated models can also help professionals assess signal integrity and carry out rigorous materials measurement tasks. These are used across a wide spectrum of industries to optimize network performance by increasing security and troubleshooting. Network analyzers have evolved through the years to become more powerful and compact. Agilent, Rohde & Schwarz, Anritsu and Advantest are the most popular brands providing both bench top and portable tools for field use. 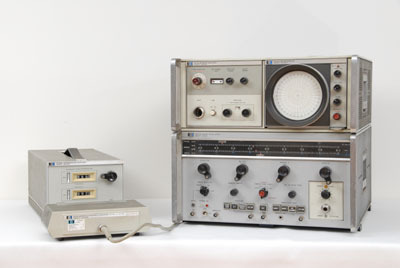 The unwieldy and cumbersome scalar network analyzers that were prevalent just a few decades earlier have given way to the more efficient vector instruments. The development of more efficient fabrication techniques has made this possible. These sophisticated vector instruments can measure magnitude and phase parameters more accurately and have done away with the need to invest in large instruments with many complex external components but restricted capacities. Although network analyzers have changed avatars through the years to become more efficient and compact, the measurement principles that drive these instruments remain essentially the same. To better understand how network analyzers measure, it is crucial to keep in mind that the primary function of these analyzers is to detect and measure the impedance mismatch that may occur between two RF components. This facilitates increased signal integrity and power efficiency. A network analyzer produces a sine wave signal across varied frequencies. The device under test (DUT) reciprocates by generating an incident signal that gets transmitted through the device and then is reflected back from it. The frequency wavelength determines the amount of signal transmitted and reflected. On the other hand, the specific properties of the DUT and the anomalies, if any, in the regular impedance of the system determine the responsiveness of the device to the incident signal. So, if the DUT has an impedance mismatch, it could produce extra and unwanted responses. A network analyzer measures the reflection coefficient, which is a ratio of the reflected signal and the incident signal, and the transmission coefficient, which is the ratio of the transmitted and incident signals. These two numbers help determine the operational efficiency of the DUT. Some sophisticated network analyzers also use scattering parameters (S-parameters) to monitor systems. The vector network analyzers by Agilent are some of the most efficient and versatile systems that are around currently. 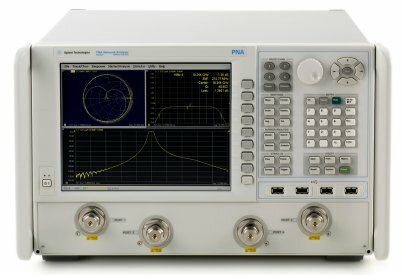 The Agilent N5230A-025 is an extremely powerful instrument that can measure varied kinds of multi-port and balanced components and RF modules with frequencies of up to 20 GHz. Its automatic port extension measures and even corrects anomalies of in-fixture devices automatically. 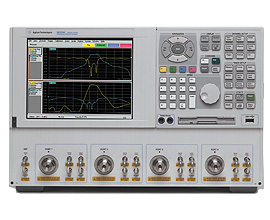 The Agilent E8357A-015 can measure RF modules that range in frequency from 300 kHz to 6 GHz. On the other hand, the 8753 Series of vector network analyzers from Agilent can measure RF modules with frequencies of up to 3 GHz. These Agilent network analyzers can measure and display a comprehensive range of amplitude and phase characteristics of even complex electrical networks. Apart from magnitude and phase, these characteristics may include S-parameters, reflection coefficient, insertion loss or gain, standing wave ratios, gain compression, attenuation group delay, and return loss. These instruments combine impressive speeds and accuracy levels making them ideal for the stringent component test requirements of today.